Depression can be a hidden illness. We fail to notice that someone we used to socialise with has slipped out of our circle. Yet it’s a common condition. It can begin in childhood. It may be brought on by failure or rejection, or by some cause buried in your past. A life change, like going to university, moving house, changing your job, having a baby can all result in pressures you hadn’t expected. The greatest problem with depression is that you feel so low that you don’t even want to take the steps which could lead to healing. You need friends. Your greatest friend is the Christ who experienced the darkness of Gethsemane, yet you may find even that hard to believe. You are not alone. Others have walked this dark path too. Help is available. People do emerge on the other side. This book addresses different aspects of the condition. It offers understanding advice, both for the sufferer and for family and friends. Each page of information is accompanied by a relevant prayer. 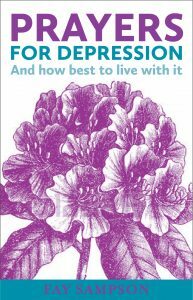 The book is divided into two sections: (1) for, or on behalf of, someone with depression, (2) for family, friends and the wider community. It is common for people suffering depression to lose their sense of self-worth. The condition may be triggered by some form of rejection: losing your job, failing an exam, the breakup of a relationship with someone you loved. You are made to feel that there is something wrong with you. You are not good enough. It’s natural to feel low afterwards. Anyone would. But you need to be concerned if the pain has gone so deep that you feel you haven’t just failed in this one thing, but that your whole life is a failure. When you have been knocked so low, it’s hard to start to pick yourself up and look at the positives. If depression has got hold of you, it can make things worse in other areas. If you still have a job, or a study course, or a relationship, then your depression about one thing may make you want to withdraw from others. You give up trying, you retreat within yourself. More things begin to go wrong. Your sense of failure can become a self-fulfilling prophecy. The one thing which is most difficult to do if you are depressed is to ‘snap out of it’. If only you could. As so often when things are hard, start with small things. Look back over your life. There have been high points, haven’t there? See if you can find a photograph or some other memento which reminds you of that. When were you happy? When did you do something you felt good about? That time was real, even if you don’t feel like that now. If it was true once, it can be true again in the future. Make a box of your ‘positives’. Open it when you feel down. Relive your times of joy. One day, you can be again the ‘you’ you were then. I put myself into your hands. I cannot find the reason for my depression. All I know is that my life has become unbearable. I give you thanks that there are those who care about my condition. People who are willing to listen to me. Those who want to take my hand and lead me to the discovery of what is wrong with me. Save me from the despair which says that no one can help me. Counter the cynicism which says it’s not worth waiting months. As the weeks stretch out, sometimes I can’t find the will to want to get better. I know that finding out what has caused my depression may be painful. Give me the courage to have old wounds re-opened. Let me know myself honestly, so that I can cooperate with my healing. you had a keen eye for those whom society rejected. You saw Zacchaeus, whose need drove him to listen from the sycamore tree. Look with compassion on my friend who needs you now. You know how inadequate I feel against the weight of this despair. I’m not trained for this; I feel out of my depth. Yet I am here, and I’m their friend. That’s all that counts. Give me the wisdom, the imagination, the sensitivity to start the conversation that will allow them to unburden themselves. Let me not lose heart when they reject my attempts. Make me a willing listener. Hold back my ready tongue from glib advice or exhortations. May I be the trustworthy friend to whom they can confide what they have told no one else. Let me be worthy to carry this precious knowledge in your name. When the talking is done, and the time is ripe to offer advice, may I choose my words well. Yet even if I am rejected, may I rest in your assurance that the talking itself has helped. I watched a family member, who had seemed a lively, outgoing girl, slide into depression. She lost her job, alienated her friends, rejected the offer of counselling. She would spend half the night on her computer, and then fail to get up in the morning. Nothing seemed worthwhile any more. She didn’t believe that anyone could help. It went on for years. Thankfully, she emerged on the other side of it. She found a job, and was successful at it. She is now married, with children. But there is a hole in her life – those years when she was friendless, without income, feeling rejected, without joy in life. Too many people still suffer as she did. Depression can strike even in childhood. Family and friends wish with all their heart that they could give the one they love their life back. Yet their offers of help are rejected. This book tries to bring understanding, both for the one with depression and for those around them. It recognises that there is no quick and easy fix. It seeks to guide you towards the positive using windows of opportunity. At such times, prayer can feel like going through the motions.When you are down so low, you no longer believe it can help. Each page of information and advice here is accompanied by a sympathetic and realistic prayer. It’s easy for friends not to notice what is happening. This book aims to alert the wider community to those who may be slipping through the net. It encourages them to act in true friendship. Depression can be hard on family members who have to live with it. They want to help, but little seems to work. There is advice and support for them too. We all of us, sufferers, family and friends, need to feel the loving arms of prayer around us.